Discussion in 'Betta Fish' started by Jnx, Apr 10, 2017. I've been off for a while due to a death in the family, and am trying to get back into posting. By way of bribing myself back to work, I picked up a new koi plakat, and added another pond to the studio. I can't seem to manage to get a pic of the new guy, pretty sure this is the first time he' seen anything other than a clear plastic cup, but here's his pond, and the nest he built after spending his first night in his new home. I'm now up to 13 bettas, 13 cories, 3 goldfish, in a total of 8 ponds and a quarantine tank. My original plakat (cleverly named OP) is still in that frst betta pond, and is doing lovely. It's been nearly a year since I got back into this, and I have to say I'm happy I did. The studio is much improved for the lively presence of fish and water. wow, that looks great! how muxh hard work did it take? and about an afternoon with a glue gun. I love this!! 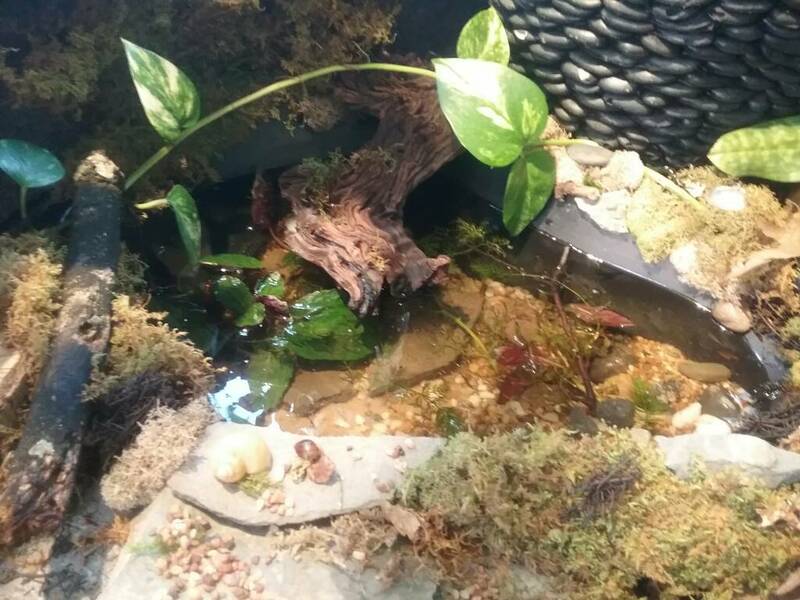 I'm looking into making a betta pond sort of thing similar to this, so I love this project! If you need any tips, let me know! I have a whole bunch of trial and horror I'd be happy to share! That is such a happy-looking room. Where's the chair to sit and soak it all in while you're reading a book?? Thank you! It even has its own weather systems! No chairs- I paint in here- if I had chairs, I'd never work! Someday I will have an art studio with colored glass bottles in every window, and a bird... and fish too. How awesome is that. Someday. It'll happen. I spent over twenty years working out of various rooms in my house (even a campground, using a jeep as an easel) until I finally got a studio. Of course, then you spend a lot of time playing in the room, and trying to convince people that it reeeeally is work. Where'd you get that giant piece of wood in the middle of your ponds?! It's only about 10" x 4". The pond is tiny. It's a $6 piece of Mopani from the LPS. Oh, wait-you mean the stump from the pond project pics? I curb shopped it in the boondocks. It's about 7 ft. (Thank the cosmos for pickups.) It was full of glass and ants. It was not fun to load alone, it was waterlogged after a flood. I love how you have them in such a natural looking habitat. Ive never seen that big of a bubble nest he must be a happy camper and so adorable him peeking out from under his nest. Nice work and lucky bettas. Thanks! I keep trying to make the outdoors indoors, lol. It is a pretty big nest, especially for such a tiny guy- I think he's pretty young. I keep waiting for him to gain confidence so he'll stop hiding. I spent some time sitting with him yesterday, so he can get used to my voice. Wow, well good luck with that. He must be trying to impress the females with a nest like that he sure impressed this one. Lol. Hunger seems to make mine brave as they will jump to get it.